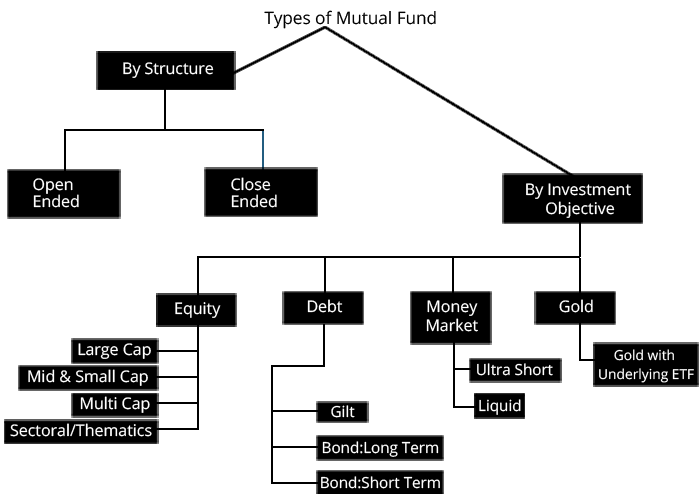 The structure of Mutual Funds in India is a three-tier one. 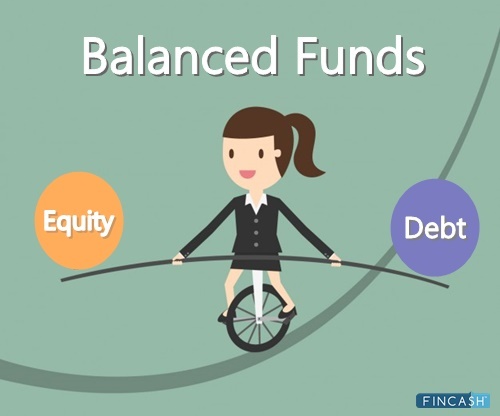 There are three distinct entities involved in the process – the sponsor (who creates a Mutual Fund), trustees and the asset management company (which oversees the fund management). The structure of Mutual Funds has come into existence due to SEBI (Securities and Exchange Board of India) Mutual Fund Regulations, 1996. Under these regulations, a Mutual Fund is created as a Public Trust. We will look into the structure of Mutual Funds in a detailed manner. 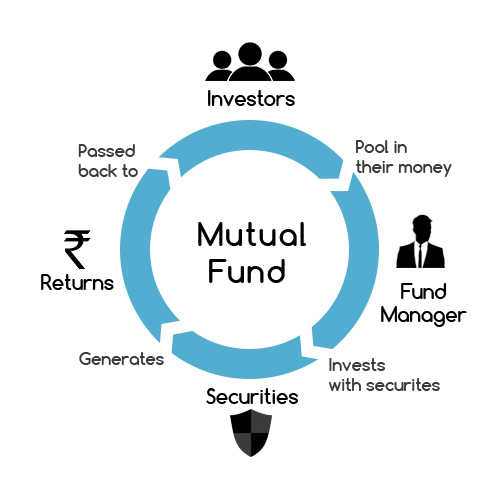 The Fund Sponsor is the first layer in the three-tier structure of Mutual Funds in India. SEBI regulations say that a fund sponsor is any person or any entity that can set up a Mutual Fund to earn money by fund management. This fund management is done through an associate company which manages the investment of the fund. A sponsor can be seen as the promoter of the associate company. A sponsor has to approach SEBI to seek permission for a setting up a Mutual Fund. Once SEBI agrees to the inception, a Public Trust is formed under the Indian Trust Act, 1882 and is registered with SEBI. Trustees are appointed to manage the trust and an asset management company is created complying with the Companies Act, 1956. The sponsor must have experience in financial services for a minimum of five years with a positive Net worth for all the previous five years. 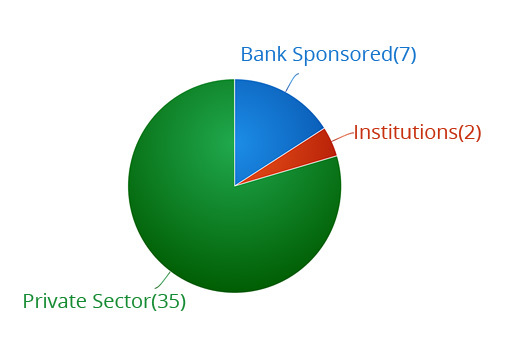 The net worth of the sponsor in the immediate last year has to be greater than the capital contribution of the AMC. The sponsor must show profits in at least three out of five years which includes the last year as well. The sponsor must have at least 40% share in the net worth of the asset management company. Any entity that fulfills the above criteria can be termed as a sponsor of the Mutual Fund. 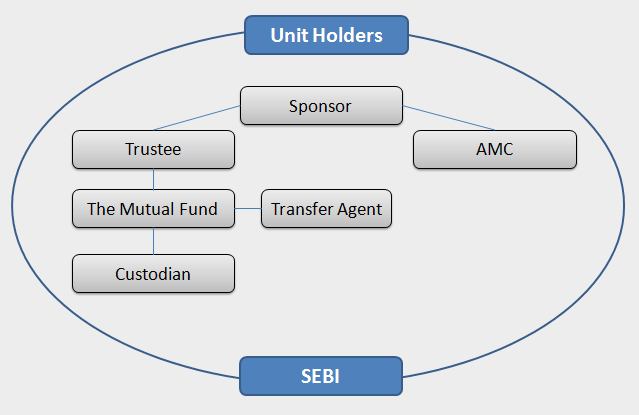 Trust and trustees form the second layer of the structure of Mutual Funds in India. A trust is created by the fund sponsor in favour of the trustees, through a document called a trust deed. The trust is managed by the trustees and they are answerable to investors. They can be seen as primary guardians of fund and assets. Trustees can be formed by two ways – a Trustee Company or a Board of Trustees. The trustees work to monitor the activities of the Mutual Fund and check its compliance with SEBI (Mutual Fund) regulations. They also monitor the systems, procedures, and overall working of the asset management company. Without the trustees’ approval, AMC cannot float any scheme in the market. The trustees have to report to SEBI every six months about the activities of the AMC. Asset Management Companies are the third layer in the structure of Mutual Funds. The asset management company acts as the fund manager or as an investment manager for the trust. A small fee is paid to the AMC for managing the fund. The AMC is responsible for all the fund-related activities. It initiates various schemes and launches the same. The AMC is bound to manage funds and provide services to the investor. It solicits these services with other elements like brokers, auditors, bankers, registrars, lawyers, etc. and works with them. To ensure that there is no conflict between the AMCs, there are certain restrictions imposed on the business activities of the companies. A custodian is responsible for the safekeeping of the securities of the Mutual Fund. They manage the investment account of the Mutual Fund, ensure the delivery and transfer of the securities. They also collect and track the dividends & interests received on the Mutual Fund investment. Updating the investor details i.e. adding new members and removing those who have withdrawn from the fund. Auditors audit and scrutinise record books of accounts and annual reports of various schemes. Each AMC hires an independent auditor to analyse the books so as to keep their transparency and integrity intact. AMC uses the services of brokers to buy and sell securities on the stock market. The AMCs uses research reports and recommendations from many brokers to plan their market moves. The three-tier structure of the Mutual Funds is in place keeping the fiduciary nature of the Mutual Funds in mind. It ensures that each element of the system works independently and efficiently. This structure of Mutual Funds is in line with the international standards and thus there is a proper separation of responsibilities and functioning of each constituent of the structure. ☆☆☆☆☆ Rated 4.6, based on 16 reviews.